We are at the halfway point of the 2019 Florida legislative session. Usually by this time, we have some idea of how our major issues will shake out, but this year has been unusual, and so far, that’s not the case. The Certificate of Need bill, which includes the elimination of nursing home CON, has passed through the House. The Senate has a CON bill as well; however, their language does not include nursing homes. Now it is a waiting game to see which version of the bill passes or if either bill passes at all. Rest assured, FHCA is focusing our lobbying on keeping nursing homes out of any legislation that would eliminate our CON. The funding battle is just now heating up, as neither the House nor the Senate budgets include the additional $138 million in Medicaid funding that played a significant role in Florida’s recent quality strides. You may recall that funding increase from 2018 was non-recurring, which means the Legislature must extend these dollars beyond July of this year. Without it, nursing centers across the state will see an average loss of more than $300,000 per center. 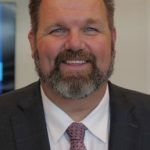 That’s a significant decrease at a time when nursing homes are struggling to keep up with operating costs, in particular the salaries and wages that are needed to recruit and retain the best possible staff to care for their residents. Advocating for renewing the funding increase and its important connection to our quality gains is a key priority for FHCA and tops our priority list as we continue meeting with legislators and bringing members to town for Lobby Wednesday visits. It’s concerning that nursing homes have become one of the Legislature’s tough choices when it comes to the budget, but maybe something good has come of it. For the first time, at least in recent history, a coalition has formed between AARP, FHCA and LeadingAge Florida. This coalition was described as a “Big Deal” by Senator Ben Albritton, and he is absolutely correct. The group, dubbed as the “Coalition for Silver Solutions,” will tackle a myriad of health care issues related to the rapid growth of Florida’s elder population. Adequately funding long term care services, waiting lists for home and community-based care and workforce issues are just a few of the topics the Coalition will address after the legislative session. In the immediate, however, the Coalition for Silver Solutions is working together to advocate for the proper funding of nursing home care by the Florida Legislature. 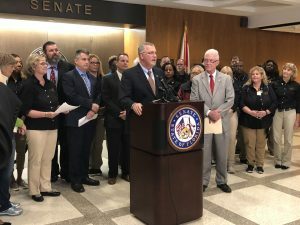 The Coalition was launched via a Capitol press conference hosted by Senator Albritton and Representative Rick Roth, with speakers from each group addressing the large crowd in attendance. Opis Senior Services Group CEO Marilyn Wood eloquently represented the association and caregivers across the state, with her more than 32 years of service to Florida’s seniors and the long term care profession. Marilyn highlighted the recent FHCA report showing that Florida has jumped from 16th in the nation into the Top Ten in overall quality. To continue that progress, she said, the state must strongly support both home-based care and skilled nursing care for those who need it. FHCA is monitoring a number of regulatory issues as well, including legislation relating to the generators and ensuring the state rules serve as the guiding regulation over local municipalities; standardizing access to patient records; consultant pharmacists’ scope of practice and more. Lobby Wednesdays are in full swing, and FHCA will continue to advocate for those that care for Florida’s frail elders.